Half way from Los Angeles to Las Vegas, I-15 passes Barstow, making this a logical place to stop and break the journey. The town does not have much to offer but two interesting sites are located nearby - one is the restored and rather commercial 'ghost town' of Calico in the mountains a few miles east while the other is Rainbow Basin National Natural Landmark, an area of badlands and folded, differently colored strata which have been eroded into small ravines and pinnacles. 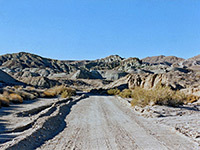 The basin is found at the edge of the Mud Hills, 8 miles north of Barstow in a completely uninhabited part of the Mojave Desert, and the loneliness of the setting is quite striking though the basin itself is less spectacular then other similar erosional sites in the Southwest such as Cathedral Gorge State Park in Nevada, certainly during the heat of the day when the colours can appear rather drab and the rocks weathered and dusty. They look better when lit by the long rays of sunset as then the hues are much more vivid and the shadows enhance the natural undulating textures. 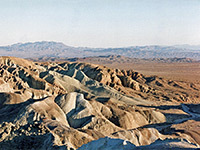 Rainbow Basin is reached by driving 6 miles along the busy Irwin Road, which heads out of town to the northeast and ends at the main gate of the Fort Irwin Military Reservation, part of a vast complex that occupies hundreds of square miles at the centre of the Mojave, then by turning left along the Fossil Bed Road for another 3 miles. This is a good quality gravel track that later curves back south and meets CA 58. A signposted right turn to the basin soon forks - right is to the small Owl Canyon campground ($6 per night) while left is a one-way loop through the basin. A notice warns 'No RVs or Trailers' but the drive is in fact suitable for all vehicles. It follows beside then partly along a dry wash, cuts left over some sandy mounds then returns down another ravine to the Fossil Bed Road. Upstream, the wash splits into many branches, all of which end quite soon at the base of eroded mudstone cliffs and sometimes have deep, narrow places, and even small caves. The cliffs and the surrounding badlands are composed of a mixture of colours of rock and sand - reds, pinks and browns, with scattered veins of white gypsum crystals. They also occasionally contain fossil bones, and the remains of a variety of dinosaurs have been unearthed here over the years. Camping is not allowed along the scenic drive, but there are many (free) alternatives to the official campsite along dirt tracks that lead into the nearby desert. The surrounding area is quiet and peaceful, with the silence broken only by occasional distant explosions and gunfire from the army base over the hills to the east. Perhaps the best hotel in Barstow is the Hampton Inn & Suites, next to the Tanger Outlet Mall on the southwest side of the city, just off Interstate 15. East-facing rooms enjoy spectacular views across undeveloped desert plains towards the distant Newberry Mountains. The inn provides free hot breakfast and has a 24 hour convenience store where snacks and drinks may be purchased.